Arctic Cat/Arcto PWC Covers are available through CoversDirect® from three of the highest-grade cover manufacturers in the industry: Carver Industries, Covercraft, and Westland Industries. These manufacturers have been in business for many years and have excellent reputations for quality manufacturing and customer service. Covercraft and Westland offer custom covers for many Artco models such as the Barracuda, Daytona, Monte Carlo, Montego, Tiger Shark, and TS. If neither of these manufacturer's offer a custom cover for your model, try one of our styled to fit covers by Carver. 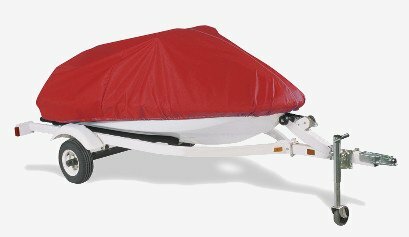 Carver offers 6 sizes of Jet Ski Covers which are based off overall length, width and height dimensions. Our covers are available in top of the line materials Sunbrella, Ultra'tect, Sharkskin, Poly-Guard and Sun-DURA. All materials available are great for either indoor or outdoor storage and will offer outstanding water repellency, breathability and UV resistance. Carver's PWC covers come with a free tie down kit which includes 6 tie down straps. This tie down kit is great for securing the cover during regular storage or for trailering. Carvers covers are all made in the USA in Landrum, SC! Westland's Jet Ski covers are custom-fitted to your exact watercraft. Each one constructed with a heavy-duty shock cord encased in the hem for a snug fit and finished with sewn in tie down loops. Covercraft's PWC covers come reinforced at key stress points. Their covers also have sewn in reflectors for safety purposes. Covercraft's jet ski covers even feature a sewn in quick dry mesh bag for storing items such as gloves and goggles. A zippered gas cap access panel will allow you to easily refuel without removing your cover!